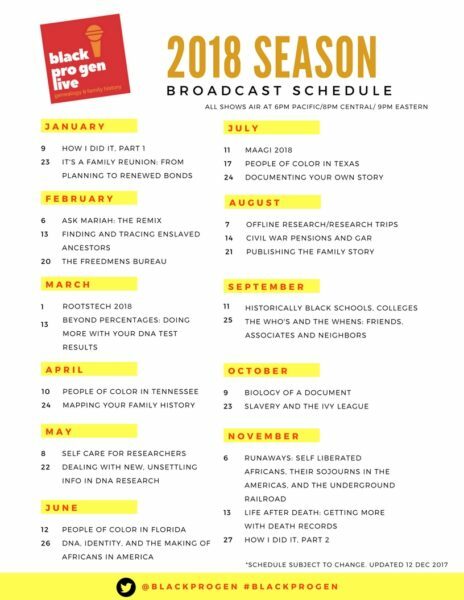 New Look, New Year: Announcing the BlackProGen LIVE 2018 Season! 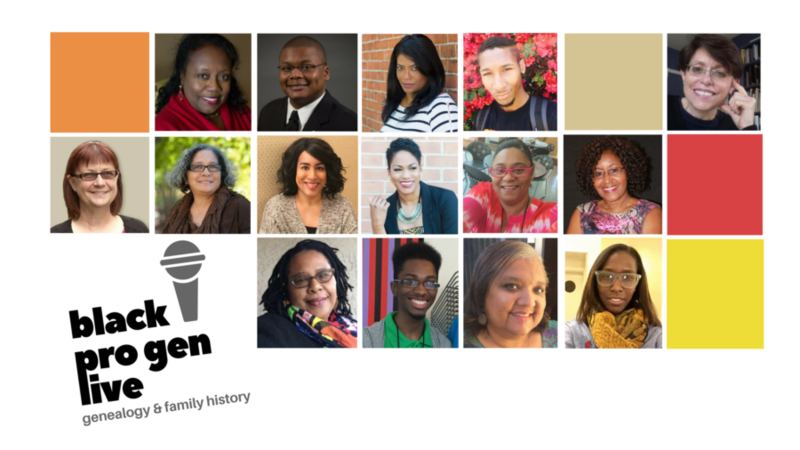 BlackProGen LIVE is: top row (l t r): Angela Walton-Raji, James Morgan, III, Linda Buggs-Simms, Alex Trapps-Chabala, Ellen Fernandez-Sacco; middle row (l t r): Toni Carrier, Shelley Murphy, Teresa Vega, Nicka Sewell-Smith (host), True Lewis (co-host), and Bernice Alexander Bennett; bottom row (l t r): Felicia Addison, Willie Russell, IV, Renate Yarborough Sanders, and Tasia Cox. We’ve been hard at work to make sure we offer the best topics and content when it comes to representing the people of color voice in genealogy and family history research. 2018 will be LIT! We’re so excited we even came up with a promo video! Schedule as of December 12, 2017. Dates and times subject to change. #48 – “How I Did It” Series #1 – Take a deep dive with select panelists as they share how they got to their most crucial research finds LIVE! #49 – It’s a Family Reunion: From Planning to Renewed Bonds – Family reunions are one of the greatest events to gather and share your family history project. Get tips and tricks on how to plan a successful reunion where the memories made will last generations. #50 – Ask Mariah: The Remix (Our 50th Episode Party!) – Can you believe we’ve already hit episode 50! To celebrate this milestone, and to kick off this year’s Black History Month series, join us for a full episode of Ask Mariah, where viewers get a chance to have their research questions answered LIVE! #51 – Finding and Tracing Enslaved Ancestors – Researching the formerly enslaved is not impossible, but can be challenging and take time. Learn the the nuts and bolts of researching this segment of our ancestors, the emotional aspects of the search, and how it can add breadth to your family history project. Special Guest: Chris Haley, Director, Study of the Legacy of Slavery in Maryland at Maryland State Archives. #52 – Deconstructing the Freedmens Bureau – It’s records go WAY beyond labor contracts and it wasn’t ever a bank. Discover the origins, history, and how to properly search for documents that makeup one of the most important record sets created during the reconstruction time period, The Bureau of Freedmen, Refugees, and Abandoned Lands. #53 – RootsTech 2018 – It’s the largest genealogy conference in the world and we’re there! Get caught up on the sights, sounds, and more at this year’s RootsTech conference. #54 – Beyond Percentages: Doing More With Your DNA Test Results – DNA tests for genealogy are now part of the permanent landscape in family history research. Did you know you can get much more info than what’s on your fancy pie chart? Learn creative ways to find the previously unknown relations of your ancestors, how to confirm or deny oral history, and how we use the tools offered by DNA companies to expand our own research. #55 – People of Color Genealogy Research in Tennessee – Learn tips, tricks, and more for researching your ancestors in the volunteer state! Special Guest: Melissa Barker, The Archives Lady. #56 – Been Around the World: Mapping Your Family History – Knowing where something took place is crucial in family history research. In this episode, we’ll cover how you can use and create maps and how they can give a huge boost to your research efforts. #58 – Pa Not Pa: Dealing With New, Unsettling Info in DNA Research – DNA for genealogy can provide some huge wins but also deliver unexpected news. In this episode, we’ll discuss the types of unsettling info one can encounter and ways to deal with potentially life changing information. #59 – People of Color Research in Florida – Learn tips, tricks, and more for researching your ancestors in the sunshine state! #60 – Indian in My Family: DNA, Identity, and the Making of Africans in America – As millions have learned their genetic ancestry, historical narratives are continually being challenged. Episode 60 will discuss how genetic genealogy is now informing how people of color identify and how the information is changing the established narratives about American history. #61 – MAAGI 2018 – It’s the premiere event to attend to become a master genealogist and family historian specializing in African American research. Check out why all the hype exists about the Midwest African American Genealogy Institute! #62 – People of Color Research in Texas – Learn tips, tricks, and more for researching your ancestors in the lone star state! #63 – What About You?!? Documenting Your Own Story – Researchers spend so much time on dead people that they often overlook the story brewing right before their eyes – THEIR OWN! In this episode, we’ll discuss how to dial back and learn how to document your story as you do so for your ancestors. #64 – Researching Beyond the Internet (Offline Research) – On-site research trips are crucial for successful genealogy and family history research. Learn how to properly prepare, what to do while on the ground, and how to distill the information you collect while researching offline. #65 – After the War Has Gone: Civil War Pensions and the Grand Army of the Republic – Tracing back to a Civil War veteran can be key in breaking through the brick wall. Learn about these priceless files along with the history and documents generated by the fraternal organization of Civil War veterans founded in 1866. #66 – Publishing the Family Story – From Oral History to Narrative – Do more than print a report from your genealogy software. Discover innovative and visually pleasing ways to share your research efforts that will keep your family wanting more and more! #67 – Historically Black Schools, Colleges, and Universities – HBCU’s (historical black colleges and universities) have been the bedrock of the African American community since their inception. For that reason alone they are genealogical goldmines! In this episode, we’ll talk about how to uncover connections to these institutions, how to research your family members who attended them, and more. Special Guest: Dr. Lopez Matthews, Howard University. #68 – The Whos and the Whens: Identifying Friends, Associates, Neighbors and the Timelines in Between – Play aunts and uncles, folks your grandmother was close to but you don’t know if they’re related or not, the business who everyone seemed to deal with. Researching the friends, associates, and neighbors in your family can be key in moving your research further. Tune in to learn about how their genealogy can help you! #69 – Biology of a Document: From Analysis to Plan – Have you ever found a document, added the details to your database, and then never looked at it again? Get more return on your research investment by learning how to break down and analyze all of the info on the documents you gather and where to proceed in your research afterward. #70 – Slavery and Ivy League Universities – Recent news about some of America’s elite universities having ties to slavery has been eye opening. Tune in to learn about specific institutions, their connections, and how to verify if your ancestors were involved. #71 – Runaways: Self-Liberated Africans, Their Sojourns in the Americas, and the Underground Railroad – The story of the enslaved often doesn’t focus on those who resisted the institution and fought to end it. In this episode, we’ll discuss uprisings, revolts, and movements intended to liberate those who were unwillingly chattel slaves in the Americas. #72 – Life After Death: Getting More with Death Records – Tune in to discover the leads you can gather just from obtaining, reviewing, and distilling information from death records. #73 – “How I Did It” Series #2 – For our final show for 2018, take a deep dive with select panelists as they share how they got to their most crucial research finds LIVE!